This afternoon, while driving home from a short trip into Brookline, we passed a woman walking a tiny four-legged creature that appeared to be more fur than dog. Why are they called Pomeranians? One hates to confess this sort of thing freely on the Internet, but I’m not exactly up on my dog breeds. So I had to ask the iPhone. Wikipedia tells me that Pomeranians are named after Pomerania, a region of Central Europe that spans eastern Germany and northern Poland. Although Pomeranians are descended from large working dogs from the Arctic, most of the breeding that turned the larger Spitz dogs into toy-sized Pom-Poms like the one we saw promenading on the Brookline sidewalk happened in Pomerania. How did Pomeranians get so small? 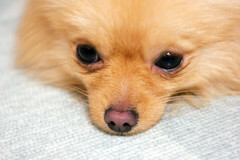 Although Pomeranians weigh a mere 4-7 pounds now, they weren’t always smaller than your average house cat. Apparently their small size is at least partly Queen Victoria’s fault. She adopted a small red Pomeranian in 1888, sparking a craze for the smallest Pom-Poms. Although the Queen’s dog was considered small for the time, it was a relative monster by today’s standards–weighing in at nearly 12 pounds. Thanks in part to Queen Victoria’s efforts in importing smaller Pomeranians from Europe for the royal breeding kennel, Pomeranians as a breed shrank nearly 50% by the time the Queen’s reign ended in 1901.